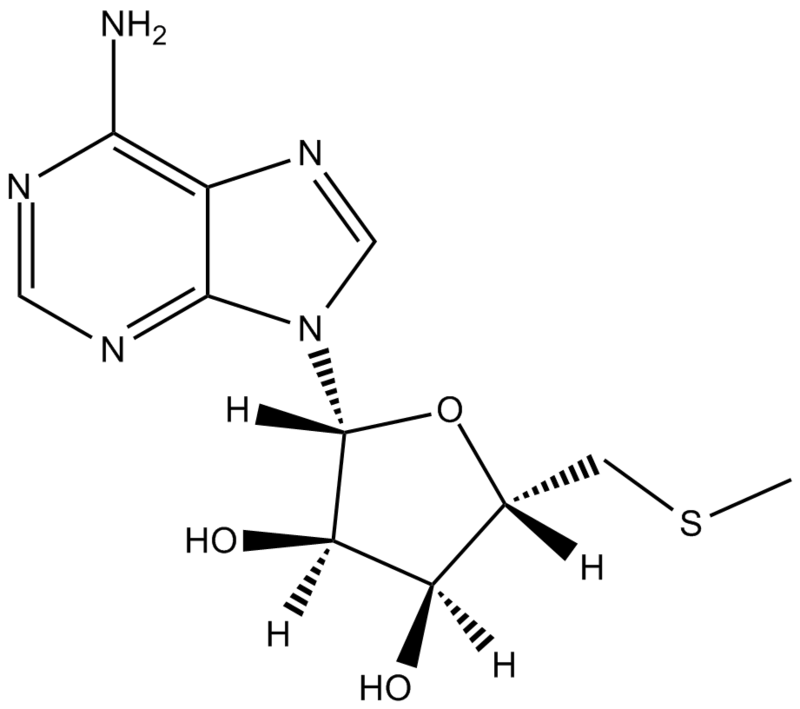 Methylthioadenosine (MTA) is a naturally occurring sulfur-containing nucleoside in all mammalian tissues. MTA is mainly produced from S-adenosylmethionine via the polyamine biosynthetic pathway, behaving as a powerful inhibitory product. In vitro: MTA was found to be solely metabolized by MTA-phosphorylase, to yield 5-methylthioribose-1-phosphate and adenine, which was a key step in methionine and purine salvage pathways, respectively. Previous studies suggested that MTA coud affect various cellular processes. MTA had been shown to be albe to influence plenty of critical cell responses, such as proliferation, gene expression regulation, differentiation as well as apoptosis. Though most of such responses had been only observed at the pharmacological level, their specificity made it tempting to speculate that endogenous MTA might play a regulatory role in the cell . In vivo: The hepatoprotective effects of MTA had been evaluated in a model of CCl4-induced chronic liver damage in rats. In this study, MTA could reproduce the human lesions induced by alcohol and viral infections of the liver. In addition, replenishment of the hepatic pool of MTA showed strong anti-oxidant effects and also reduced liver cell damage and fibrosis . Clinical trial: Up to now, MTA is still in the preclinical development stage. Avila MA,García-Trevijano ER,Lu SC,Corrales FJ,Mato JM. Methylthioadenosine. Int J Biochem Cell Biol.2004 Nov;36(11):2125-30. Pascale RM,Simile MM,De Miglio MR,Feo F. Chemoprevention of hepatocarcinogenesis: S-adenosyl-L-methionine. Alcohol.2002 Jul;27(3):193-8.